It has taken four years for the Idaho economy to approach the job levels it boasted before the worst recession in generations. Total nonfarm jobs have been right around 100 percent of the monthly peak before the recession took hold in Idaho in 2008. 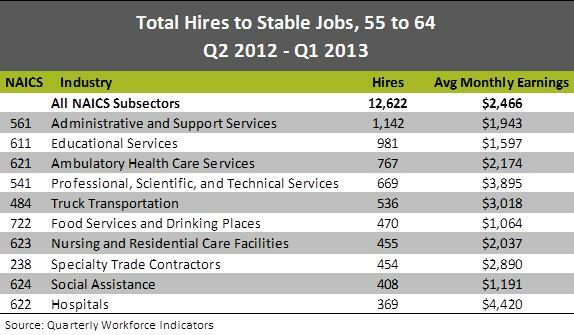 Employers were also hiring at near their prerecession levels, but the activity has shifted among the industry sectors. This entry was posted in Employment News and tagged idaho department of labor, idaho economy, idaho jobs, industries, recovery on December 18, 2014 by Idaho Department of Labor. The aging workforce will have an overarching effect on the economy in the years to come, but older workers are feeling the impact now. With the effects of the last recession still lingering, knowing which industries are more apt to hire older workers is critical to today’s job seekers. This entry was posted in Employment News and tagged idaho department of labor, idaho economy, industries, jobs, older workers on June 2, 2014 by Idaho Department of Labor. Community leaders and economic development professionals are typically interested in the types of businesses that should be added to their local economies. Any answer comes against the backdrop of the existing business mix that is the result of a century or more of economic evolution and market forces. But in some cases industry growth struggles to keep up with population growth. Madison County was Idaho’s fourth fastest growing county between 2000 and 2012 when its population increased 36 percent – almost 10,000 residents. Much of the growth was spurred by the transition of two-year Rick’s College into four-year Brigham Young University-Idaho. But neighboring Jefferson and Teton counties were also in the top-five fastest growing counties in the state. This entry was posted in Employment News and tagged economy, forecast, idaho department of labor, industries, location quotient, Madison County on February 24, 2014 by Idaho Department of Labor.